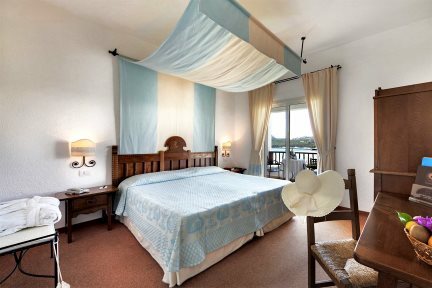 A grand 5-star hotel set beside the stunning blue waters of Santa Teresa Gallura, boasting fantastic views and great facilities. Located in Sardinia’s scenic north west, Colonna Grand Hotel Capo Testa is a marvellous 5-star presenting all the luxury, comfort and indulgence of a modern Mediterranean hotel. Perfect for a beach holiday due to its position close to the sand, whether you’re a couple after a romantic escape or a family in search of a diverse and memorable getaway, you’ll find the location and facilities of this hotel most rewarding. The hotel consists of 125 guest rooms, including Classic, Superior and Deluxe rooms, as well as Suites, all offering plenty of space, comfort and good amenities. Guests will benefit from the likes of satellite TV, a mini-bar, air-conditioning and Wi-Fi in their room, while also having the added bonus of a balcony or terrace from where to soak up the beautiful nature of the surrounding gardens or the breathtaking sea views. Guests will have plenty of opportunity to make the most of the great range of facilities offered at the hotel. If the inviting swimming pools aren’t enough to recharge your batteries, the wellness centre, spa and fitness centre are sure to help you feel rejuvenated. In addition to this, guests will benefit from access to two restaurants and two bars on-site, while the private beach area is the ideal place to soak up some summer rays. 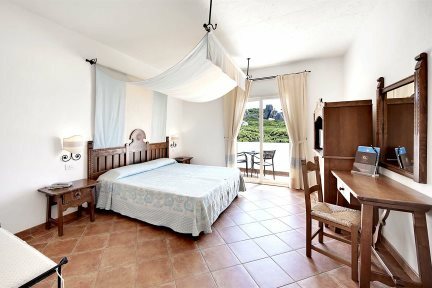 Large swimming pools on several levels including sea water infinity pool and whirlpool area, free shuttle service to Santa Teresa di Gallura at pre-set times, 2 restaurants, 2 bars, private well-equipped beach with sunbeds and beach umbrellas, wellness centre & spa (payable locally), fitness centre, mini club, free Wi-Fi. Satellite TV, Wi-Fi, telephone, safe, mini-bar, air-conditioning and a balcony or terrace. 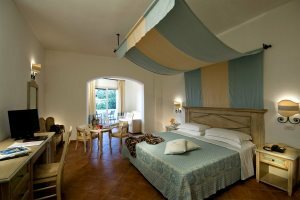 The Classic room is furnished in a traditional Sardinian style, and includes Wi-Fi, safe, satellite TV, mini-bar, hairdryer, shower, air conditioning and balcony or terrace. It can accommodate a third bed or a cot for babies. 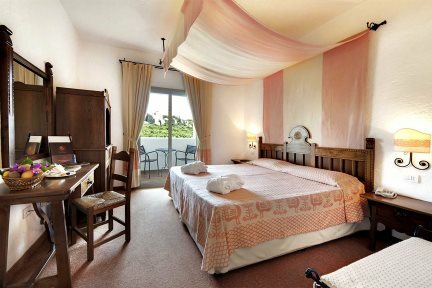 The Superior room is furnished using natural wood tones and pastel colours and includes Wi-Fi, safe, satellite TV, mini-bar, hairdryer, shower, air conditioning and balcony or terrace. It can accommodate a third bed or a cot for babies. The Deluxe room is elegant and refined in its interiors with a spectacular view of the gulf, it includes Wi-Fi, safe, satellite TV, mini-bar, hairdryer, shower, air conditioning and balcony or terrace. It can accommodate a third bed or a cot for babies. The Junior Suite and lounge offers intimate and exclusive space, with private veranda furnished with sunbeds, a table and a breathtaking view of the blue sea of the Gulf of Capo Testa, the Suite includes Wi-Fi, safe, satellite TV, mini-bar, hairdryer, shower, and air-conditioning. 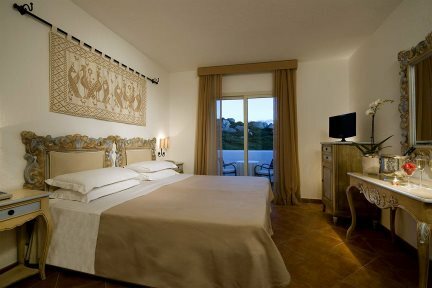 The Executive Suite is situated on the top floors of the hotel with a captivating view of the the Gulf of Capo Testa, the Suite includes a double bedroom, a separate lounge, a foyer with a walk-in wardrobe and two balconies (including a large panoramic veranda with Jacuzzi tub). The Suite includes Wi-Fi, safe, satellite TV, mini-bar, hairdryer, shower, and air-conditioning. Santa Teresa Gallura is a village situated at the extreme northern end of Sardinia overlooking the beautiful Strait of Bonifacio. 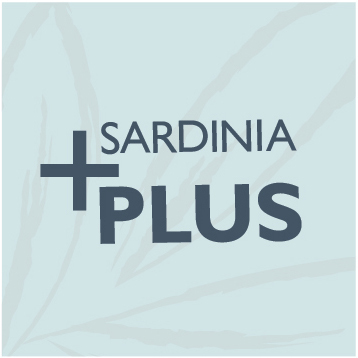 Its port ensures excellent links from and to La Maddalena island and Corsica - perfect for day trips. The sandy beach of La Rena Bianca is just a short stroll from the town centre where on clear days it is possible to admire the iconic white cliffs of Bonifacio. Porto Pozzo with its harbour and water sports is only 4km away, and during the spring you can admire lavender plants and sea poppies. The beach at Rena Bianca is 700 metres long and is covered with very fine sand that at the water's edge has a pink reflection thanks to the tiny fragments of corals you can find there. The water colour shifts across what feels like a thousand tones of blue and the gently shelving nature of the shallow water means it's safe for children. The beach is well equipped and sheltered from the western wind. This sheltered beach has clear water and is surrounded by coves and Mediterranean vegetation ideal for snorkelling and diving. This beach is very popular with scuba divers thanks to the excellent visibility and abounding rocks. Discover the exquisite coastline from the sea and enjoy the excellent conditions of the north east coast for wind-surfing, sailing, diving, snorkelling, etc. An up-market town and centre of indulgence, it is located around two yacht harbours on the north side of this dazzling stretch of coastline, and being the main resort of the area and a paradise for the jet-set, it’s definitely worth a visit.